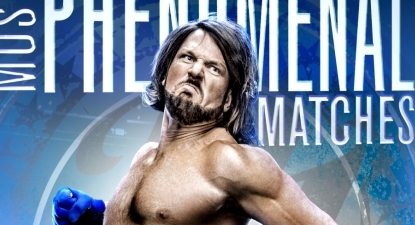 For AJ Styles’ first-ever WWE DVD presenting 20 Phenomenal matches we’re going to need some “Phenomenal” cover artwork to go along with it. In fact, this release is so “Phenomenal” we’re going to need two different covers for it! You’ve read the content listing, you’ve watched the trailer and now it’s time to get a look at the official cover artwork WWE has in store for “AJ Styles: Most Phenomenal Matches”. WrestlingDVDNetwork.com can now unveil the artwork you can expect to find worldwide on WWE’s 2018 AJ Styles DVD. We can also reveal today that there will be an “exclusive” version of the Styles DVD that will feature an alternate cover design! The current plan is to make this available in both the United States and in Europe with retailers/e-tailers currently being decided upon. “AJ Styles: Most Phenomenal Matches” will be the major WWE Home Video offering this November, to be produced as 3-disc DVD set with close to 9 hours of content; the best matches of AJ’s run with WWE so far and brand new interview segments with “The Phenomenal One” himself. Here’s the first cover, stay tuned for a look at the alternate version soon! – UK/Europe: November 5th. Pre-order your AJ Styles DVD soon on Amazon.co.uk. – United States: November 6th. Pre-order your AJ Styles DVD now here on Amazon.com. – Australia: TBA. Look out for a pre-order announcement soon at Madman.com.au. Another highly anticipated title we can’t forget is also still to come this year is “Shawn Michaels – The Showstopper Unreleased”. WrestlingDVDNetwork.com has received new information on the HBK DVD which shows how WWE plan to fill up each of the discs. That’s a total of 8 hours and 30 minutes of content packed with loads of unreleased gems! You can already pre-order “Shawn Michaels Unreleased” over on Amazon.com or WWEDVD.co.uk. Before HBK stops the show, the next 3-disc WWE DVD offering will hit stores in exactly 3 weeks time: “30 Years of SummerSlam”. Secure your copy and pre-order now for $23.74 by clicking here to Amazon.com. EBAY WATCH: All of these “Phenomenal” wrestling DVD auctions listed below are due to expire in the coming days – grab a bargain on rare stuff like Vengeance 2002 and a still-sealed WrestleMania 18, a few Blu-rays, PPV box sets, an ROH AJ Styles DVD, and more! They could’ve been a bit more imaginative with this cover IMO. I mean this is basically the TLC 2016 PPV cover. I do think the lack of effort with most artwork this year is indicative of physical media just not being a priority for WWE anymore. I liked the HBK artwork, but that’s about it. Here’s hoping the alternate artwork is better! I know this is off this topic and article and I apologize for that. I just gotta know,am I the only one who wants Legends of Wrestling to continue on dvd? I mean brand new made for dvd episodes highlighting all time greats. Like the first new release could be Lou Thesz/Buddy Rogers . Yes this one would include the NWA world title match between the two. Along with the WWWF title defense from Buddy Rogers against Miguel Rivera. Along with 3 more matches for Rogers as well as 3 more for Thesz. The next release could be PEDRO MORALES/EDDIE GUERRERO. The extras could be 4 WWWF championship defenses from Morales,his IC title victories over Ken Patera and Don Muracco. And ofcourse his tag title win with Bob Backlund over the Wild Samoans. Also 5 of Eddie’s greatest unreleased matches. Next one would be Gorilla Monsoon/Vader . Featuring as extras The 90 minute draw (edited ofcourse) between Bruno Sammartino and Monsoon for the WWWF championship,along with 4 more classic Monsoon matches. Maybe some interviews Gorilla did with many superstars over the years. And ofcourse 6 matches from the career of the recently late always great Vader. SCSA/Mr Mcmahon,The Brisco Brothers/The Funk Brothers,Gorgeous George/Stan “The Man” Stasiak,Harley Race/Ivan Koloff,Brothers Of Destruction/The Midnight Express ,…..all I can think of for now anymore ideas comment. Let’s make these editions of Legends of Wrestling happen. We can do it! while I would appreciate some more instances as well, I absolutey don’t see that happening, at least not on dvd. I’m not sure some of those matches you’re referencing even exist on video. Specifically the Rogers vs Thesz title change from January 1963. I’ve never seen any footage of that anywhere. Also the 90 minute Pedro vs Bruno match is another one I don’t believe exists. No footage from the 1972 Shea event has ever been seen. There’s a few things they stopped too early, Patrick. Greatest Rivalries stands out the most. They could have gone in a great direction with that type of theme. They also could’ve and honestly should have continued the WWE Network series Rewind and in doing so expanded it beyond just WM Rewind to include memorable/significant/important matches that are worth documenting that didn’t happen at WM. The 1992 RR match, Team WWF vs The Alliance from the 2001 SSeries, HHH vs Rock or Sasha Banks vs Charlotte from Summerslam 98 or 2016 respectively, Cena vs HBK from a RAW in 2007, Taker vs Angle from 2006 NWO, and so on. Like the WM Rewind series on The Network, the participants in the documented matches must provide comments bc that was the attraction of the series in the first place even more so than the match being shown in full. Yep. As well as a spin-off of sorts by covering “dream rivalries/matches” that ended up happening (AJ vs Lesnar) or the many that sadly did not and probably won’t end up being a reality (Taker vs Sting, Austin vs Goldberg, AJ Styles vs HBK, Bret Hart vs Kurt Angle, so on.) These will be most effective if the aforementioned talents were present to comment. I do think we need to consider that if any of these concepts were popular enough, or making enough money, they probably wouldn’t have been dropped. the cover ain’t to bad. i still think the summerslam dvd could of been so much better but eh i guess.